Here begins “Take Me Out To The Ballgame”, part two. If you haven’t already read part one, you might want to go back a few days and read it before proceeding. 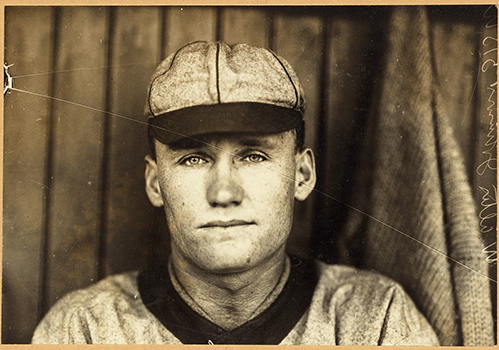 After the Winston-Salem Twins championship season of 1913, Luke Stuart returned to Guilford College in the fall for a reunion with his college teammates. Two of them were Quakers from the East Bend area of Yadkin County. Ernie Shore, whose family owned a huge farm on the Yadkin River and had become famous for their prolific distillery*, was studying engineering . 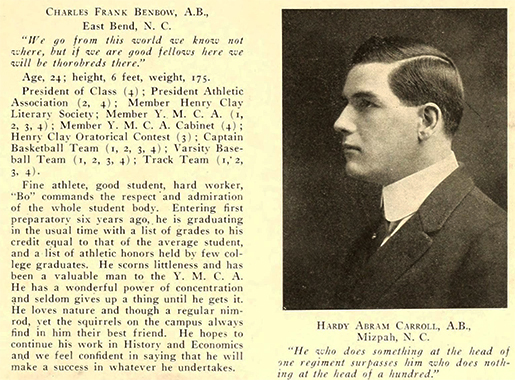 Charlie Frank Benbow, from downtown East Bend, majored in history and economics. 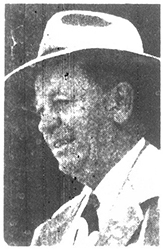 Shore would graduate with honors from Guilford, become an assistant baseball coach there, then move on to the major leagues with the Boston Red Sox, where he was Babe Ruth’s roommate, then lived in the household of JFK’s grandfather, “Honey Fitz” Kennedy, won three out of four pitching starts in the World Series, losing only his first game to the legendary Grover Cleveland Alexander, injured his arm, came home to Winston-Salem and sold insurance, brought Babe Ruth and the New York Yankees to Winston-Salem for a couple of exhibition games, during which one of these the Babe hit the longest home run of his career at Piedmont Park, became the foreman of the grand jury that indicted Ab Walker and Libby Holman for murder in the mysterious death of Smith Reynolds at Reynolda in 1932, and because of that experience, decided to run for sheriff of Forsyth County, where he served as the most innovative sheriff in the South for 36 years. Maybe some day I will summon the energy to do a post on just Ernie…what a man! Left, Ernie Shore, Guilford College pitcher, 1914. Right, Shore with Grover Cleveland Alexander at the 1915 World Series. 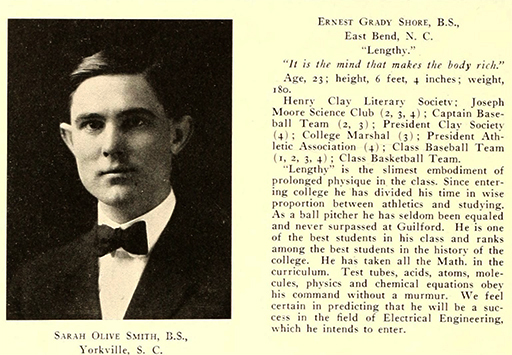 Images from “The Quaker”, Guilford College yearbook, 1914, at digitalnc.org, and Wikimedia. Of the three, Charlie Frank was by far the best all around athlete, starring in basketball, baseball and track and field. 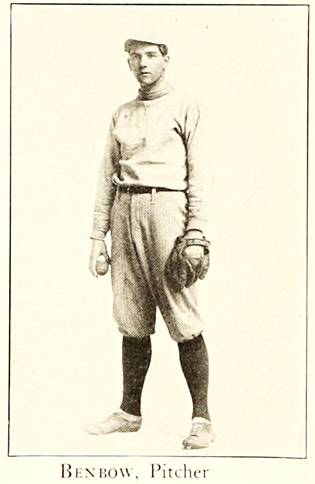 He had already played two professional baseball seasons, with the Wilson Tobacconists in the Eastern Carolina League (1910) and the Petersburg Goobers in the Virginia League (1911). Also in 1911, he scored 91 points in a Guilford basketball game against the Durham YMCA, this in an era when a high scoring game for both teams was a combined 50 points. 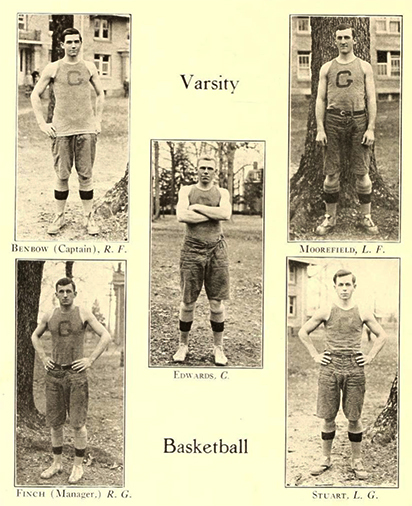 In 1912 and 1913, with Benbow at right forward and Stuart at left guard, Guilford won the Virginia-Carolinas college basketball championship, twice beating UNC by big margins (35-20 and 44-21) and losing only one game, a major upset, 12-14, to Trinity (later Duke). Maybe Trinity employed an early version of the “mongoose” offense, invented by Chuck Noe and adapted by Bucky Waters at Duke, which led to Dean Smith’s “four corners” at UNC. Upon graduation from Guilford in 1914, Charlie Frank returned home and taught school for several years in East Bend. After service in World War I, he moved back to Winston-Salem and began a general contracting business. In 1928, he bought attorney Eugene Gray’s home on North Broad Street, between Four and 1/2 and Fifth Streets, demolished it and built the Gray Court apartments, at the time the largest apartment complex in the city. 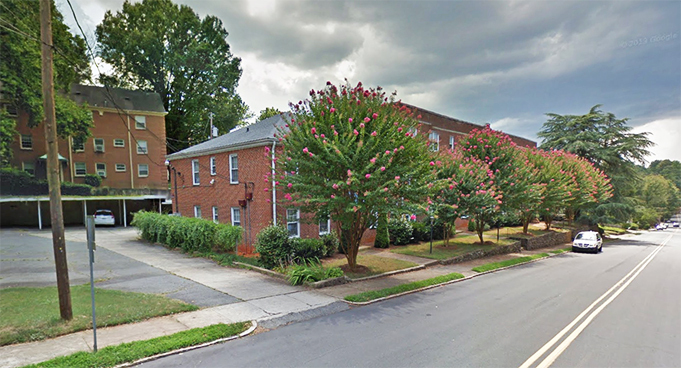 Over the next few years, he built a couple of other apartment complexes, including the Mayflower Apartments on Glade Street at West End Boulevard. During World War II, he played important roles on the local rationing board, for which he received a number of awards. He died an untimely death on April 4, 1946. His son, Charlie Frank, Jr. would become one of the best known vice presidents at the R.J. Reynolds Tobacco Company. 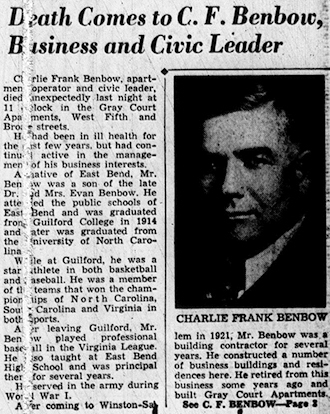 Charlie Frank Benbow’s obituary, 1946. 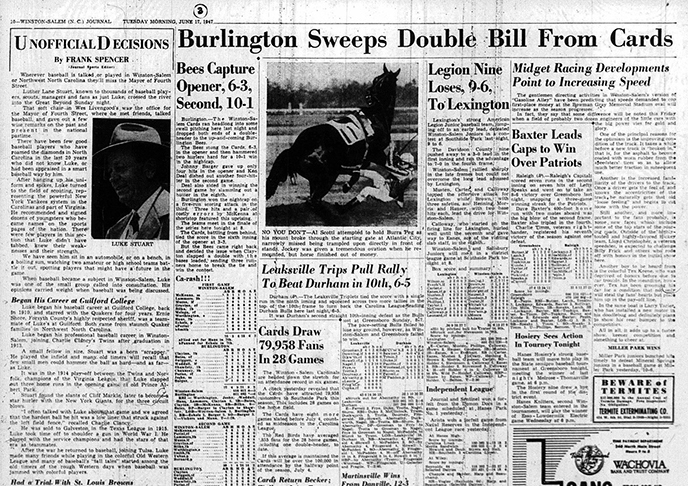 Winston-Salem Journal microfilm. Gray Court apartments, built 1928, became the hot spot for singles in the Twin City. Google Maps. 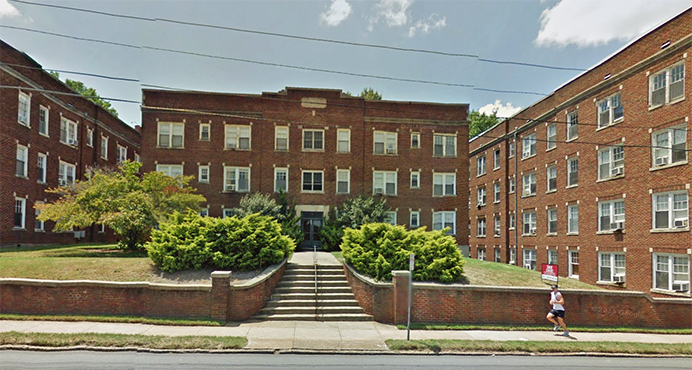 Mayflower Apartments on Glade Street, built 1938, became the hot spot for young married couples. Google Maps. Luke Stuart was from a different world than Shore and Benbow. He was born Luther Lane Stuart on May 23, 1892, one of eleven children of sharecroppers Patrick and Mary Perry Stuart in Coble Township in Alamance County. But by the early 1900s, his parents had bought a farm near Greensboro. Like his brothers and sisters, Luke worked on the farm, but his talent at baseball would change his life forever. 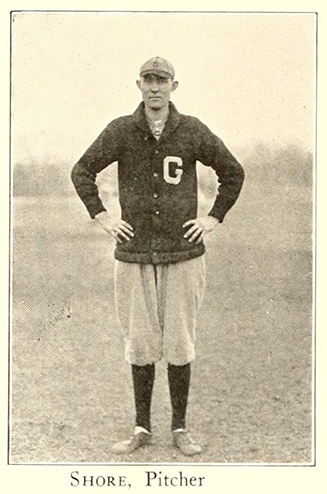 In 1912, he entered Guilford College. The next spring, he and his Yadkin county teammates compiled the best record among North Carolina college teams at 13-1 and won the Virginia-Carolinas college championship. Luke led the team in hitting with a .415 average. Again, Luke joined the Twins and helped them to win their second straight North Carolina State league championship in 1914. 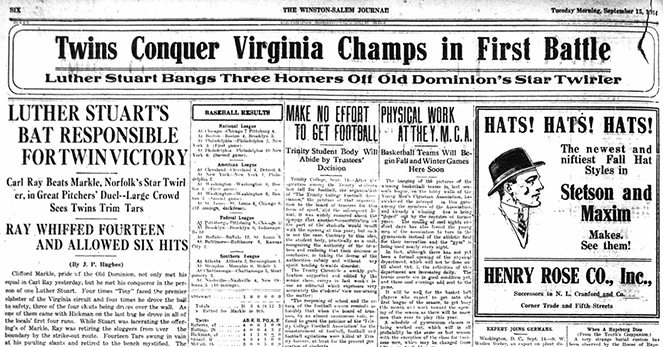 After that season, manager Clancy challenged the Virginia League champions Norfolk Tars to a best of three series to determine the Carolinas-Virginia championship. In game one, the Tars started their best pitcher, Cliff Markle, who had led the Virginia League with a record of 31-9. The Twins responded with their ace, Carl Ray, who pitched a magnificent game, allowing only six hits and striking out fourteen Tar batters. But that didn’t really matter, because Tiny Stuart simply demolished the pride of the Virginia League. Luke went four for four, and three of those hits were home runs, a North Carolina State League record. That same year, Frank “Home Run” Baker had led the American League in home runs for the season with nine. The Twins lost the second game, but a day later, Ray pitched another masterpiece. Luke did not hit a home run, but provided most of the offense once again. The Twins claimed the championship. Luke spent another season with the Twins in 1915, then moved to the class B Texas League in 1916-17, playing for Galveston and Houston. At the entry of the United States in World War I, he volunteered for military service. Upon his return in 1919, he retired from baseball and took over management of a garage while living on the family farm in Guilford County. But in 1921, he was invited to unretire and try out for the second base job on the American League St. Louis Browns. On July 28, he made his major league debut as a late inning defensive replacement, fielding his only chance cleanly, but not getting an at bat. Over a week later, he finally came to the plate at Griffith Stadium in the top of the ninth of a 16-3 Washington blowout. The pitcher was none other than Walter Johnson, still today the greatest pitcher of the modern era of baseball. In 1924, Walter Johnson, along with Babe Ruth and Ty Cobb, were filmed for an “instructional movie”. In this film, he is just warming up, so seems to be barely throwing the ball, but his motion was so smooth that it did not look much different when he was firing fastballs at batter after batter. For decades, his sidearm motion has been forbidden to aspiring pitchers at the Little League level. Maybe they are wrong. Walter Johnson was the greatest pitcher in baseball history. Despite pitching for the Washington Nationals, as often as not a very weak team, he won 417 games, struck out 3,509 batters, pitched a major league record 110 shutouts and finished with a 2.17 earned run average. But one batter, Luke “Tiny” Stuart had his number. Most rookies would have had a knee knocking moment, but Luke strode confidently into the first pitch and hit a two run home run to left field. As a reward, he started the next day, went oh for two, but reached base on an error and scored a run. The next day he was shipped to Tulsa of the Western League. 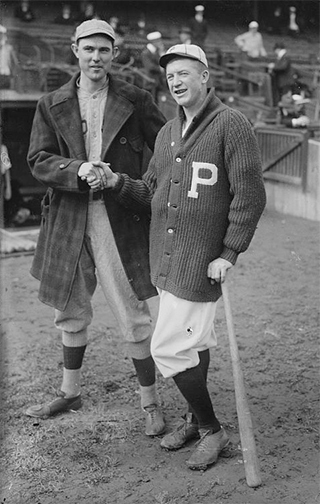 Walter Johnson, left. 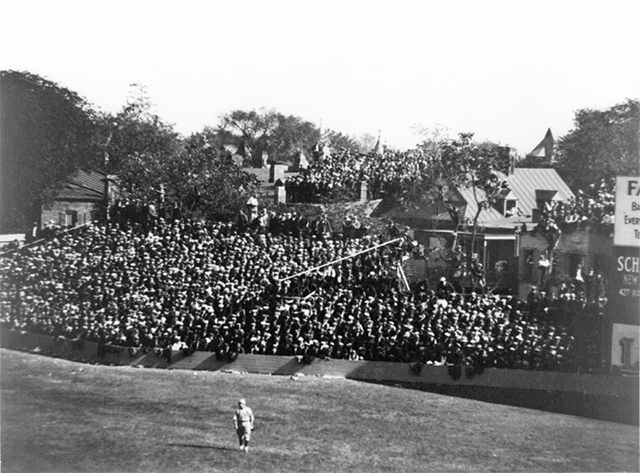 Griffith Stadium, 1921, right. People living outside the park built bleachers on their roofs and charged a small fee for watching the games. Soon thereafter, the baseball owners built a very high fence to block the view. When he objected, citing his homer off Johnson, he was told that he could choose between Tulsa and nothing. Who of us would have chosen nothing? Luke had three great years at Tulsa, the best of his baseball career, but when it became obvious that he had no future in the majors, he retired for a second time at age 33. By then, his Guilford teammates had achieved business success in Winston-Salem, so instead of returning to the garage, he began a career in insurance and real estate in the Twin City. For a number of years he sold insurance for the Pilot Insurance Company, then became an officer of their real estate division. Many men like Luke became minor league managers, hoping for a shot at the majors. But he chose a steady income, and because he had an eye for talent, became a scout for the New York Yankees. What better second job for an old ball player than to be paid for watching baseball games? 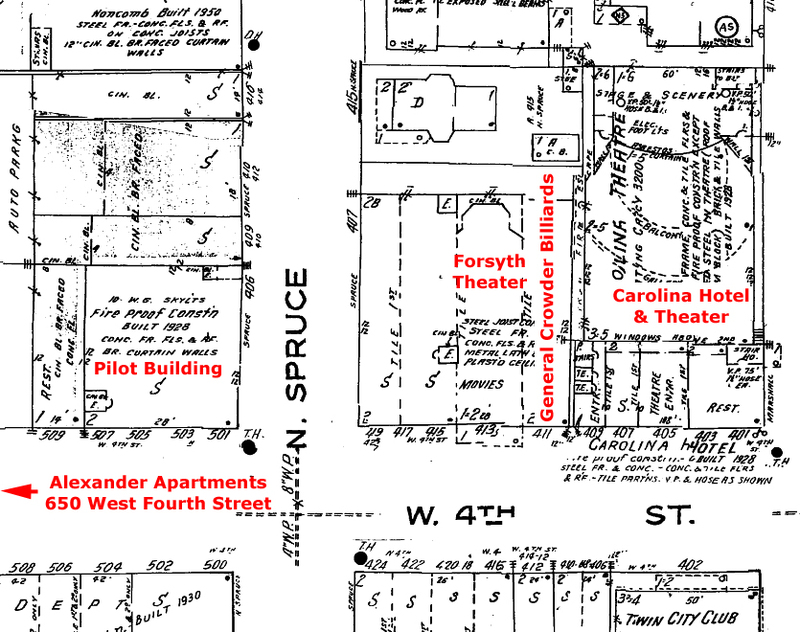 Luke lived in the Alexander Apartments at 650 West Fourth Street, less than a two block walk to work in the Pilot Building at the corner of Fourth and Spruce Streets. In the next block east stood the Carolina Theater and Hotel and the Forsyth Theater and in between them, the General Crowder Billiard parlor, owned by another local baseball hero, Alvin Crowder, who had had a long and successful major league career with the Washington Nationals and the Detroit Tigers. Old ball players stick together, so Luke was a regular at the General Crowder Billiard establishment. So much so that he had a reserved seat on one of the couches there. And his baseball knowledge led his friends to dub him the “Mayor of Fourth Street”. He was an integral part of his community. This 1937 photo defines much of Luke Stuart’s world. 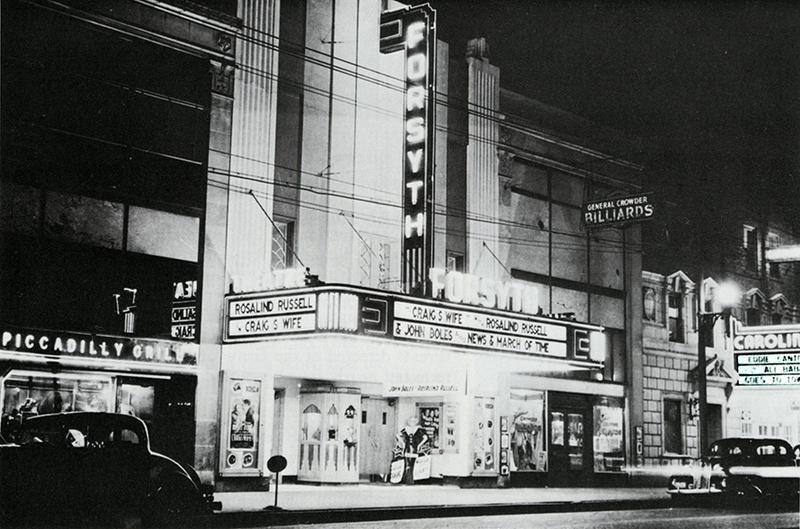 If you had a date, you took her to the trendy Picadilly Grill for dinner and then to the Forsyth Theater to see “Craig’s Wife”, starring Rosalind Russell, or to the Carolina Theater, where Eddie Cantor was holding forth in “Ali Baba Goes To Town”. If you didn’t have a date, you could drop into the General Crowder Billiards in between and have a couple of cold ones, served up by bartender Jim Holland, with your pals. One Monday morning in 1947, the janitor made his way into Luke’s office in the Pilot Building. He found Luke slumped in his chair, his wrists cut and a bullet wound in his chest. According to the local papers, Luke had left a letter for his brother, the contents of which were never revealed. Local word said that he had been suffering for some time with a fatal disease. A couple of days after Luke’s death, legendary Journal sportswriter Frank Spencer gave him a farewell column. Microfilm does a lousy job with pictures, but here is a Photoshopped best effort at Luke’s final portrait. I grew up believing that Earl Averill, in 1929, was the first American league player to hit a home run in his first major league at bat, because that is what the official record said. By the time that I was twelve, I knew it all, so much so that when Myrt Powers won $32,000 on the $64,000 question, I sat in our living room and answered every question before she did as my parents lost their minds at the lost winnings. Of course, we had no idea that she had cheated, and I had not. Averill was a highly touted rookie and his feat was reported in the New York Times and other major newspapers. At the time, a number of local papers pointed out that Luke Stuart was actually the first, but were ignored. 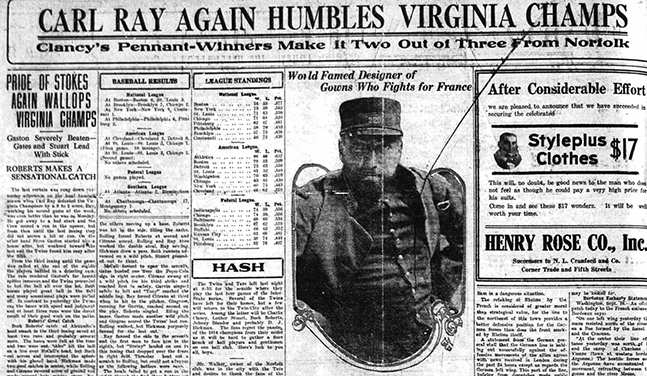 Averill, who later became one of the few players to actively campaign for a spot in the Baseball Hall of Fame, won out, until the 1990s, when the Society for Baseball Research corrected the error. If you do write about Sheriff Ernie Shore as mentioned above, you should include Guy Scott who was the best and most interesting detective that worked with the Sheriff’s Office during Shore’s time and probably prior Sheriffs. I worked for the Forsyth County District Attorney’s Office from June 1959 to Jan. 1971. I heard many say Guy Scott had the “nose of a bloodhound” when he was on a case. I could just see in his face and “all-knowing” twinkling eyes that he had many secrets that I wished he could just sit and tell me his stories. P.S. I do love and appreciate your articles of baseball’s history in our area. How many women’s baseball teams were playing while the men were away at war? Yes, I knew Guy Scott. He told great stories about the adventures of the “Spider Gang” and about busting up stills round and about. When Milt Machlin’s book “Libby” came out, Guy called me, mad as all getout, to get an address to complain to. I’d love to have read that letter.